Half-Day Heaps of Fun! Paddle your own boat! Thrills & Spills inclusive, All equipment provided (Wetsuits Boots etc). Whanganui River / Whakapapa River Tours. Half Day – Full Day Options. Fully Guided / All Equipment Supplied. 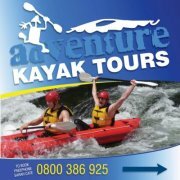 White Water / Scenic & Family Trips available. No Experience Necessary. Paddle the scenic Whanganui River or the Crystal clear Whakapapa River using our New Zealand made 2 Person Inflatable Kayaks. Be In control of your own boat, its just like rafting only your the one doing the work! The rapids are grade 2-3 – Not too big & not too small. Heaps of fun, any one can do this! The scenery is stunning! Pristine native forest with crystal clear mountain water. Be prepared to get wet and laugh a lot! The boat’s are a cross between a kayak and a raft. They offer the maneuverability of a kayak and the stability of a raft making them virtually impossible to tip over. They slide over and around rocks following the natural flow of the water. Their design makes them suitable for people with no previous experience to enjoy the river as they would in a raft, but it allows them the freedom to be in control.